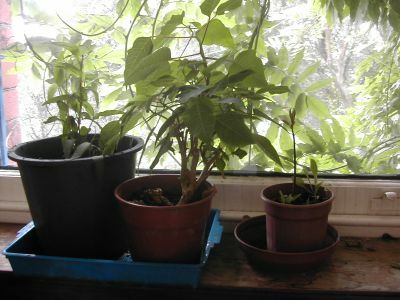 Our windowsill is getting full of plants. I read on a couple of people’s blogs that they had been germinating avocado seeds, about 6 months ago, and I decided to have a go. I soaked about three in water for about 6 weeks, decided nothing was happening and chucked two of them into the compost bin. The third I recklessly shoved into a defunct plantpot on the patio, whose occupant had given up the unequal struggle for survival. This was a few months ago now. On Monday, when I was skirting round there looking for somewhere to pot on the Japanese coriander, I noticed this plant pot… complete with avocado seedling!! So I brought it inside before I forget it and the nights get colder or the slugs finish it off. The unpredictability of nature. (Incidentally, in the first picture, the extra leaves sprouting all over the place come from the wisteria growing up the front of the house). I have tried many times to start an avocado but never had any luck. Someone told me it depends on the time of year but I tried at different times. Maybe I have to just plant it and forget it too. They do grow into huge tall trees eventually so you may have to buy a bigger house later on. Lol. Years ago I put two avocado pears in the airing cupboard to ripen and forgot about them. They were sprouting and a tad soft when I rediscovered them. 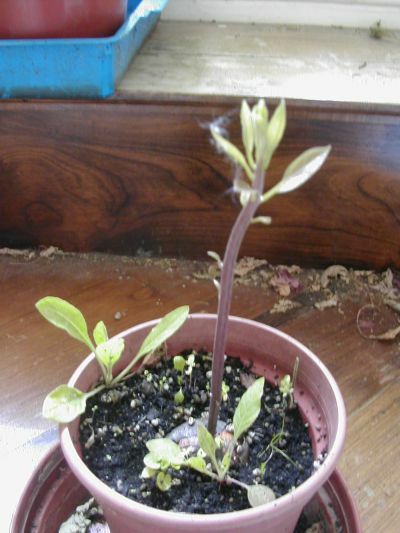 One gre to about 5′ tall before someone emptied some diluted tomato feed into the pot. It dies within days. Either that or a small cat peed into the pot. Previous PostPrevious Megaliths and castles!